Rookie defenseman, Eric Gelinas, really turned some heads in his first season with the New Jersey Devils. I feel this would be an appropriate time to look at his stats, considering that he just signed a 1 year extension with the team, worth $900,000...also known as a bridge contract, or a "prove-it" in my own view. As far as stats go, for defensemen it isn't as cut and dry to determine value, as there are so many different types of defensemen in the league. If we're going to use the terms EA uses for the NHL-franchise video games, there can be offensive defenseman (think Mike Greene from the Caps comes to mind), defensive defenseman (Kimmo Timonen), two-way (Ryan McDonagh), and enforcer (Zdeno Chara). Since there are so many possible uses of defensemen, there are a few overall ways to quantify performances of defensemen, such as basic and possession stats, zone start analyses, zone exit and entry stats, and player usage charts come to mind, immediately. In addition to the quantified evaluation, there is a certain qualitative analysis that goes into valuing a player (every player, not just defensemen). Do they fit into the team system? Are they able to hold their own? These are all important factors that must be taken into consideration when looking at a player. I think the first thing that really caught the attention of not only the coaching staff, but the fans, to Eric Gelinas happened a year ago today. In the beginning of the third period of a pre-season game against the Rangers, a powerplay was coming to a close when Gelinas got the puck along the blue line. With a quick movement of his hands, the puck was in the back of the net. Gelinas played in 60 games in the NHL this past season and accumulated 29 points (7G 22A) in that time. His 6'4", 205 pound frame helped solidify his physical presence on the blue line. Gelinas became a real fan-favorite when his slapshot found the back of the net, once again against the Rangers. This time though, it was in overtime in MSG. Okay, so a big, strong rookie defenseman emerges with a wicked slapshot. What happened? Well, there's a difference between using a young player to his advantages and helping him develop as an overall player. Gelinas found himself more and more limited to the powerplay, where he was on the point, rightfully so. But that was about it, really, for the NHL level. Eventually, Gelinas was sent down to Albany, the AHL affiliate of the Devils, to help further his development before stepping onto the "big ice" again. Personally, I think management sent him down after the disastrous outdoor game for the Devils, against the Rangers at Yankee Stadium, in January. Gelinas was caught a little flat-footed in his own end which resulted in lots of scoring chances and odd-man rushes for the Rangers. Justin Bourne, a writer for TheScore, does a fantastic breakdown of some of the things that went wrong in this article. It's interesting to think about the difference between the progression of the NHL year between Eric Gelinas and fellow rookie defenseman, Jon Merrill. They both started on what seemed like opposite ends of the spectrum: Gelinas started out really hot and eventually cooled down, while Merrill was very quiet in his game, and eventually really began to step up as a defensive staple on the team. As for Gelinas's future role on the team? There's no doubt that slapshot is his key to the NHL, but I expect fellow offensive-defenseman, Marek Zidlicky, will mentor Gelinas on responsibility in pinching along the boards and providing offense without being a liability in one's own end. Unfortunately I don't see the possibility of the two being on the team for a very long time, since, right now, they are extremely similar in playing style. But now that the qualitative look at Gelinas is over, let's look at some more numbers. This picture above is called a player usage chart I copied from SomeKindOfNinja, a useful site for charts. Do you see Gelinas's circle? It's the small one on the very right. I have used player usage charts before in previous articles, so this is not something new, however this is a little different of a graph. Essentially the higher a circle is up on the y-axis, the tougher opponents they faced. The further right on the x-axis means the more times they are deployed for offensive zone face-offs. This is indicative of an offensive-defenseman, and can oftentimes boost one's corsi rating. Gelinas's circle is red because his Corsi relative% is negative, and if a circle is blue, like Adam Larsson's, it means that the Corsi relative% is positive. The size of the circle is indicative of the "size" in difference of Corsi relative%. What that means is that the smaller a circle is, the closer a Corsi relative% is to 0. Gelinas's Corsi relative% is -0.7, while Marek Zidlicky's is -1.6%, so Gelinas has a smaller circle because his Corsi relative% is closer to 0. Remember, this is 5-on-5 (even strength) ice time stats. 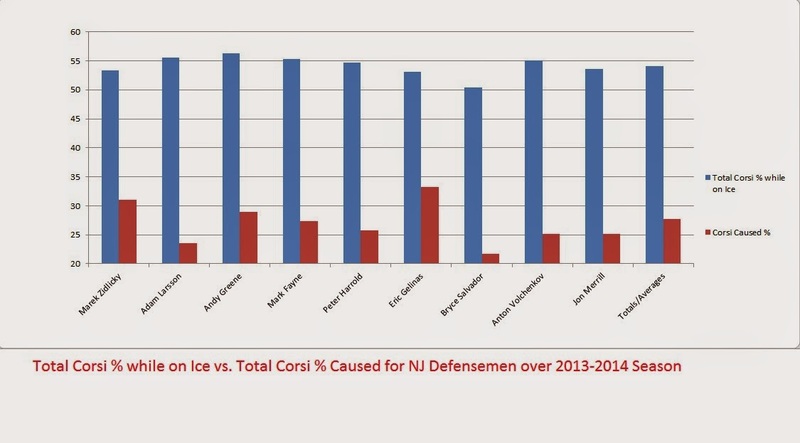 The graph above is a look at how Gelinas compares to the other defencemen on the Devils in the categories of Corsi For% (blue), and Corsi Caused% (red). Gelinas flaunted the highest Corsi Caused% of any Devils defenseman last season, and but had the second-lowest Corsi For%. Gelinas logged 808:39 minutes of even-strength ice time last season. In that time, he registered 11 points (2G 9A) and had a 53.2% CorsiFor%. Taking into account his large amount of offensive zone starts, Gelinas's Zone-Start-Adjusted Corsi is 50.77%. His even strength stats included 0.148 goals/60min, 0.668 assists/60min, for a total 0.816 points/60min of ice time. While those numbers may not jump off the charts, remember that he is still a defenseman. How do these numbers compare to his powerplay stats. Gelinas played 141:02 minutes of ice time on the powerplay last season, registering 15 points (3G 12A) in that time. These numbers lead to a 1.276 goals/60 min, 5.105 assists/60min for a total 6.381 points/60min of powerplay time. How do these numbers compare to another offensively-focused defenseman? Below is a table differentiating Gelinas's numbers from Senators' defenseman, Erik Karlsson. There is a statistic in hockey known as PDO, which is a measure of luckiness on the ice. It combines the shooting% of a player or a team as well as the team's save%. A PDO of 1000 is considered normal, and a PDO higher than 1000 is considered "lucky, and lower is considered "unlucky". Gelinas's PDO, according to ProgressiveHockey was 1008. This measurement is meant to show that Gelinas did not just get lucky on his goals and on the ice over the course of the season. Just for reference, the lower PDO last season was Alex Edler of the Vancouver Canucks, with a 954 PDO, and the highest PDO belonged to Dustin Penner and Gustav Nyquist, with scores of 1056. Interesting to note that Steve Bernier of the the Devils is second-lowest on that list, with a PDO of 959. Two key stats for a defenseman, in my opinion, are passing % and zone exit numbers. Above are passing numbers for all Devils defensemen last season, taken from an article from In Lou We Trust. The measurements in the %DZP, %NZP, and %OZP are the percentage of passes made in each zone. For example, Eric Gelinas's %DZP was 71.7. That means that out of all the passes Gelinas made over the 60 games he played last season, 71.7% of them were in the defensive zone. 12.8% of his passes came in the neutral zone, and 15.6% of his passes came in the offensive zone. The very right column is a measurement of pass completion %. This means that of all the passes that Gelinas attempted last season, he completed 63.3% of them, which was the highest on the team. This chart is much wider, so mobile users aren't going to be too happy with it, but I really think it's just as important. This is a measurement of zone exit stats (from the same ILWT article). Like the passing table above, I included the entire defense for comparison. So let's break it down. Eric Gelinas had the puck in his own zone and attempted to exit the zone (get it?) into the neutral zone 432 times last season. Of those 432 times, he succeeded 321 times, meaning he had a success rate of 74.3%, which was actually below the team average of 78.8%. A defensive zone exit can either be done one of two ways: passing the puck or carrying it yourself. Carrying it yourself is referred to in the chart above as "Possession exits". Gelinas had 187 possession exits, meaning that 36.7% of his zone exits were possession. The next column is an average number of attempts and successes per game. Gelinas is averaging 5.4 successes of 7.2 attempts per game, which are both lower than the team average. This isn't necessarily a bad thing though.When a player is unable to exit the defensive zone, it is because of a turnover. The last column measures the average number of defensive turnovers per game. Gelinas 1.55 defensive turnovers per game. 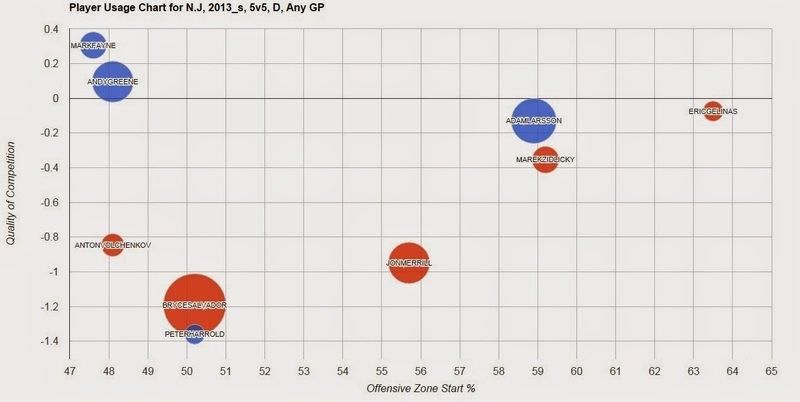 This isn't very good, but it's about the same as Andy Greene and Marek Zidlicky. Gelinas is going to have to earn his spot on the team in the upcoming training camp, but that is a distinctive possibility. Devils fans know that they have a gem with this kid and that he is going to be a big player in a few years. He just needs to work more on his defensive game if he wants to thrive in the New Jersey system. Like what you read? Follow me on Twitter @DTJ_AHockeyBlog for more articles!